While in general the left is far more reality-based than the right, there are areas where segments of the left are mistaken.As I’ve noted several times in the past, there are some on the left who have been repeating arguments based upon fallacious data to claim far greater quality for the VA system than actually exists. A problem with those advocating health care reform repeating the fallacious arguments in support of the VA is that those of us who have seen the results of their system know the claims are untrue. Every time there is new information about deficiencies in the VA system the credibility of those who support the VA model is undermined, which also casts doubt upon their legitimate arguments in support of health care reform. Conservatives are right that government does not do a good job in managing health care. A government take over of health care would be a bad thing. Of course health care reform is not a government take over of health care, and government regulation to counter the abuses of the insurance industry is beneficial. Health care reform has nothing to do with situations such as VA hospitals. Similarly it has nothing to do with Canadian or British health care. If conservatives were really interested in freedom of choice they would be enthusiastically supporting health care reform. Of course the modern conservative movement is an authoritarian movement which has nothing to do with supporting freedom. They are far more likely to support the “freedom” of the insurance industry to limit health care options while ignoring the fact that only the use of governmental power gives people an ability to counter the power of big corporations. Unless a policy victory brings political benefits—rising poll numbers, better prospects for the next elections—it is not treated as a big win. Thus, the Tea Party movement is considered an ominous sign for Obama, evidence that the country is turning against him. But the reason that the Glenn Beck and Sarah Palin crowd is so angry is that Obama has expanded the federal government’s relationship with the private sector in fundamental ways. In political terms, the Tea Party movement may be a sign of Obama’s weakened position, but in policy terms, it is a testament to his success. As shrewd conservatives like David Frum recognize, the current mood of Republican optimism is wildly misplaced. When Republicans refused to compromise with Obama on health care, they gambled that he wouldn’t, or couldn’t, push through reform with only Democratic support. Then, when he did, they insisted that he was destroying his chances of passing future legislation. Now he’s proved them wrong again. So what if Obama’s legislative success prompts a backlash that buys the GOP a few more seats this fall? As Frum has asked pointedly, was it a win for the Republicans because after Lyndon Johnson passed Medicare they picked up seats in the midterm elections of 1966? The larger truth is this: Even as Republicans claim political momentum, the country is in the midst of a major shift leftward when it comes to the role of government. That shift is playing itself out from infrastructure to health care to finance and perhaps eventually to the environment. No one knows whether these shifts will revive the U.S. economy and lay the foundation for stable, broad-based growth, just as no one could predict the impact of the rightward turn in American policy in the early 1980s. Decades later, liberals and conservatives still disagree about whether Reagan’s reforms changed America for good or ill. What they don’t disagree about is the fact that they fundamentally changed America. Those changes made Reagan one of the most consequential presidents in American history. Eighteen months in, it’s a good bet that historians will say the same about Barack Obama. The season concluded for Doctor Who on the BBC with The Big Bang while BBC America aired Vincent and the Doctor. This review contains major spoilers for Vincent and the Doctor (which I previously wrote about here.). I have attempted to keep reviews of episodes which have not aired yet in the United States free of any significant spoilers–as frustrating as it is not to talk more about The Big Bang–but there are a few comments on upcoming events. 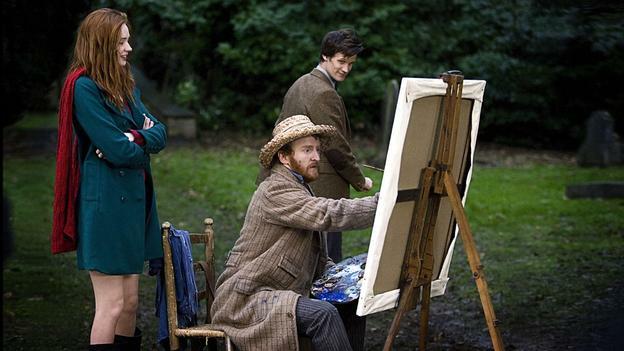 Vincent and the Doctor seems to be a stand alone episode which goes back to the original intent of the show to be educational for children, but it does fit well into the season’s overall arc. 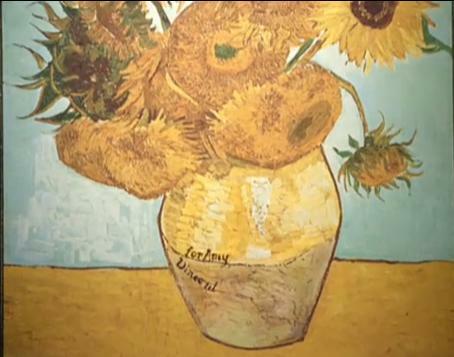 The educational aspects of the show include both Van Gogh and depression, with the BBC including a pubic service announcement on depression at the end. The episode took Rory’s disappearance from time into account. The Doctor accidentally referred to Vincent as Rory. 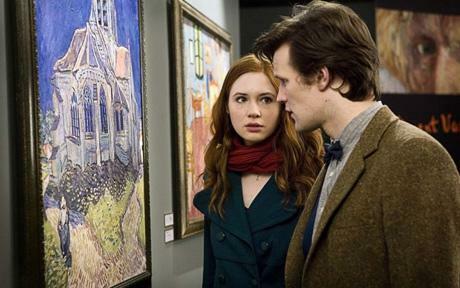 Amy questioned why the Doctor was being so nice to her, and even Vincent saw signs that Amy had suffered a major loss despite not remembering it, at least on a conscious level. The episode had the Doctor explaining that “bow ties are cool.” The Big Bang has the Doctor finding something else he considers cool. I did not notice the crack in the wall in this episode, but Vincent does play a role in the two part season finale, along with many other characters from earlier in the season. The episode included pictures of the first two Doctors and the use of a species identifier, which seemed like a combination of the “Googles” or “Layers” programs on my Droid and a rear view mirror. The rear view mirror allowed the Doctor to see this episode’s invisible monster, who in many ways was just like Vincent. Both are outcasts from their society. The Big Bang was an excellent conclusion for the season. While it wraps up some of the aspects of the season’s arc, the episode leaves some mysteries open for future seasons, including the relationship between River Song and the Doctor. The episode is extremely “timey wimy” as Steven Moffat would describe it, and shows how Moffat is more interested in writing a fairy tale about the characters than hard science fiction. Steven Moffat discussed the season after watching The Big Bang in the above interview conducted by his son Joshua. Those who do not want any spoilers might hold off on watching the above interview. Those who have watched The Big Bang and want more might enjoy this link--but hold off if you don’t want any spoilers as to the season finale. Matt Smith and Karen Gillan were interviewed by BBC Newsbeat, answering questions from viewers in the video above. The poll asked people how they’d respond if a Congressional candidate had various hypothetical attributes. Asked how they’d feel if a candidate were “endorsed by Sarah Palin,” the response was…. It turns out that there were only two attributes worse than an endorsement from Sarah Palin: “Supporting Bush’s economic policies; and supporting the elimination of various Federal agencies and/or Social Security.” Of course these things are not mutually exclusive. Nancy Pelosi’s misguided attempt to use Medicare as leverage to pass the unemployment and jobs measures in the tax-extenders bill failed. Fortunately Pelosi quickly realized there was no point in continuing this strategy when Senate Republicans again blocked passage. Forty Republicans and Ben Nelson voted against the measure, blocking the measure supported by 57 Democrats. Subsequently Pelosi backed down and the House passed the temporary Medicare fix. While misguided, at least it can be said that Pelosi meant well, motivated by a desire to promote economic recovery, which certainly could not be said of the Republicans. After the Senate passed a Medicare fix as a separate measure, she was under the mistaken belief that she had some leverage over Senate Republicans by blocking a vote on the Senate measure. I am surprised at how badly Pelosi misread the Republicans. Republicans were willing to vote for the Medicare “doc fix” but certainly would not be heartbroken if it failed and they could blame Democrats for destroying Medicare. Even if they were actually in support of the measure, their opposition to spending money on jobs or the unemployed certainly trumped any such feelings. It is very clear that the Republicans in the Senate want this economy to fail. They see that things are beginning to turn around. You know the numbers. When this president took office, we were losing 750,000 jobs a month. … Now we are gaining jobs. … Unfortunately, and cynically [on their part], in cynical political terms, it doesn’t serve them in terms of their elections if things are beginning to turn around. I believe when you look at this bill, which is all paid for — we raised revenues to pay for it — the one piece that is technically not paid for [is the federal unemployment benefit extensions and] that is done in a way that we have always done it, … [those are] always categorized as an emergency. And, frankly, if 15 million people without jobs is not an emergency, I don’t know what is. And still, it looks like Democrats might lose the vote today. And when I say “lose the vote,” I don’t mean that a majority of the Senate will vote against it. I mean that 58 senators, rather than 60, will support the legislation. All Republicans, and possibly Ben Nelson, appear to remain opposed. And why not? The less that Democrats appear to be doing on jobs — and the fewer jobs that Democrats actually create — the better Republicans will do in November. Substantial compromises on the bill haven’t brought any new votes, and that’s in part because Republicans see no political upside in passing the legislation. While it made no sense for Pelosi to believe that the threat of not passing the Medicare fix would get Republicans to vote for unemployment benefits, at least she did quickly back down and get the Medicare fixed later the same day. Getting this passed quickly was important for a number of reasons. After postponing the processing of payments since the beginning of June, Medicare began processing payments with the 21 percent cut. It will now be necessary to reissue these checks with the updated amount. Earlier in the week I saw estimates that this would cost $15 million, and this would increase with every batch of Medicare payments which must be reprocessed. 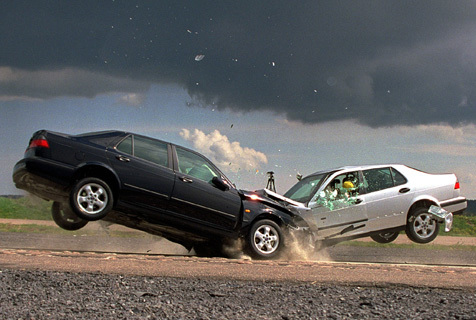 The delay also increases expenses for physicians and undermines confidence in Medicare. This might lead more doctors, who now see Medicare patients at a considerable discount compared to commercial payers, to decide against accepting Medicare patients. Now that it is established that both parties agree that this needs to be fixed, hopefully we can also achieve a permanent fix to the Medicare payment formula before the end of the year. Attempts last year failed because the Republicans had wanted to include this cost in the cost of health care reform and use it as another bogus argument against reform. Now that health care reform has been passed hopefully the Republicans will not see further political gain in blocking a permanent fix. On behalf of millions of AARP members, I urge you to immediately pass legislation that ensures seniors have access to their physicians, and provides much needed fiscal relief to the states and to unemployed individuals. Regrettably, given Congress’s failure to reach timely agreement on a Medicare physician pay package, the Centers for Medicare and Medicaid Services has now been forced to implement a draconian 21.3 percent reduction in their reimbursements. This cut threatens access to physician services for millions of Medicare beneficiaries – especially those living in rural and other underserved areas. While Congress continues to debate temporary patchwork solutions, people on Medicare are growing increasingly anxious about whether they will be able to find a doctor when they need one. Seniors, who have paid into Medicare their entire working lives, deserve the peace of mind of knowing they will be able to find a doctor who will treat them. AARP urges Congress to act immediately to stabilize doctor reimbursement rates for as long as possible until a permanent solution can be found. For nearly a decade, Medicare patients and the doctors who treat them have been held hostage by short-term patches to an unworkable Sustainable Growth Rate (SGR) formula. In the months to come, we look forward to working with Members of Congress from both sides of the aisle to repeal the SGR formula and replace it with a permanent physician payment system for Medicare that rewards value and ends the uncertainty for patients and providers alike. In addition, enhanced Medicaid funding to states to assist them with the added costs of providing health coverage to low income individuals and for home and community based services must be extended. Finally, we urge the extension of unemployment benefits for those unable to find jobs during this economic downturn. AARP members are counting on you to address these critical issues immediately to protect their health and economic security. They aren’t in the cars themselves, we are. Doctors and patients are careening toward destruction in the name of political gamesmanship. There are two potential ways to resolve this deadlock. The quickest would be for Nancy Pelosi to go along with Senate Majority Leader Harry Reid, House Majority Leader Steny Hoyer, and Rep. Robert Andrews (D-N.J.), the Chair of the Education and Labor health panel, and allow the House to vote on the temporary fix passed in the Senate last week. Nancy Pelosi has been insisting on a different course by attaching the Medicare “doc fix” to other unrelated legislation. The Senate is attempting to pass legislation which includes some of Pelosi’s goals, but it is questionable if the Senate could pass such legislation without watering it down to the point where Pelosi would not find it acceptable. For Nancy Pelosi to be the one who, at present, is blocking passage of this legislation might be political suicide for the Democrats, risking turning over control of Congress to the Republicans in November. The Democrats are already on shaky ground with seniors. As Ezra Klein pointed out earlier today, health care reform has become more popular since passage–except with seniors. The Democrats cannot afford to further alienate the senior vote, which tends to turn out more heavily in off year elections than the younger voters who are more likely to stick with the Democrats.